To cope with cancer and its treatment-related side effects and toxicities, people are increasingly using complementary and alternative medicine (CAM). Consequently, integrative oncology, which combines conventional therapies and evidence-based CAM practices, is an emerging discipline in cancer care. The use of yoga as a CAM is proving to be beneficial and increasingly gaining popularity. 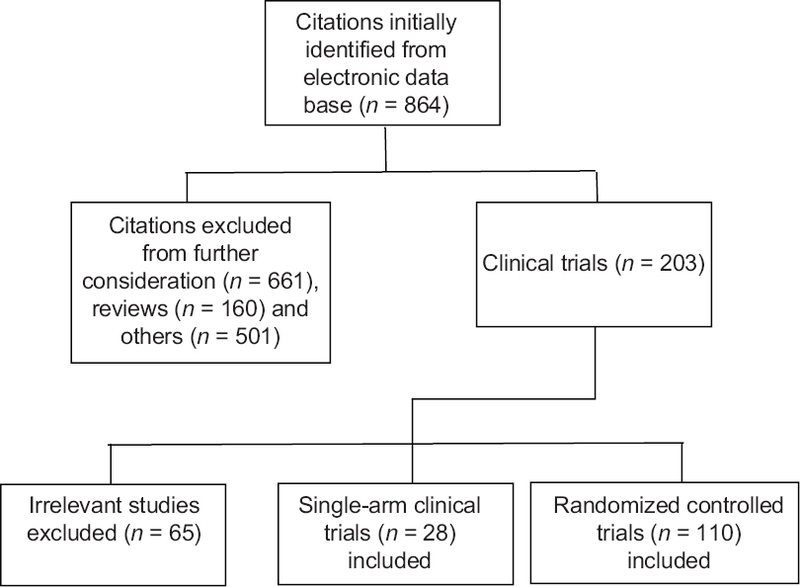 An electronic database search (PubMed), through December 15, 2016, revealed 138 relevant clinical trials (single-armed, nonrandomized, and randomized controlled trials) on the use of yoga in cancer patients. A total of 10,660 cancer patients from 20 countries were recruited in these studies. Regardless of some methodological deficiencies, most of the studies reported that yoga improved the physical and psychological symptoms, quality of life, and markers of immunity of the patients, providing a strong support for yoga's integration into conventional cancer care. This review article presents the published clinical research on the prevalence of yoga's use in cancer patients so that oncologists, researchers, and the patients are aware of the evidence supporting the use of this relatively safe modality in cancer care. Background: Rajyoga meditation is taught by Prajapita Brahmakumaris World Spiritual University (Brahmakumaris) and has been followed by more than one million followers across the globe. However, rare studies were conducted on physiological aspects of rajyoga meditation using electroencephalography (EEG). Band power and cortical asymmetry were not studied with Rajyoga meditators. Aims: This study aims to investigate the effect of regular meditation practice on EEG brain dynamics in low-frequency bands of long-term Rajyoga meditators. Settings and Design: Subjects were matched for age in both groups. Lower frequency EEG bands were analyzed in resting and during meditation. Materials and Methods: Twenty-one male long-term meditators (LTMs) and same number of controls were selected to participate in study as par inclusion criteria. Semi high-density EEG was recorded before and during meditation in LTM group and resting in control group. The main outcome of the study was spectral power of alpha and theta bands and cortical (hemispherical) asymmetry calculated using band power. Statistical Analysis: One-way ANOVA was performed to find the significant difference between EEG spectral properties of groups. Pearson's Chi-square test was used to find difference among demographics data. 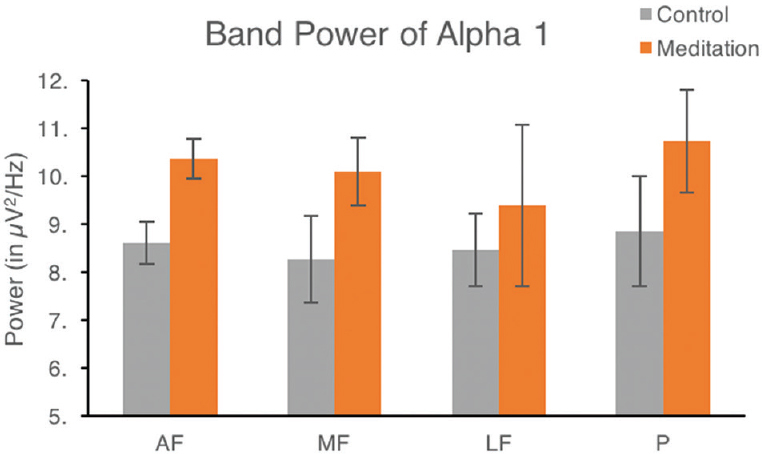 Results: Results reveal high-band power in alpha and theta spectra in meditators. Cortical asymmetry calculated through EEG power was also found to be high in frontal as well as parietal channels. However, no correlation was seen between the experience of meditation (years, hours) practice and EEG indices. Conclusion: Overall findings indicate contribution of smaller frequencies (alpha and theta) while maintaining meditative experience. This suggests a positive impact of meditation on frontal and parietal areas of brain, involved in the processes of regulation of selective and sustained attention as well as provide evidence about their involvement in emotion and cognitive processing. Context: Postmenopause, an estrogen deficient state comes with increased incidence of cardiovascular diseases (CVDs). Yoga has been described as having a beneficial effect on heart rate variability (HRV), a marker for cardiac autonomic activity which can assess cardiovascular risk, in various populations. Aim: the aim of the study was to study the effect of 3-month long Yoga practice on HRV in early postmenopausal women. Settings and Design: A prospective longitudinal study of 67 women within 5 years of menopause between 45 and 60 years of age attending menopause clinic of Department of Gynaecology, Sucheta Kriplani Hospital fulfilling inclusion and exclusion criteria and consenting were enrolled for the study. Subjects and Methods: HRV of 37 cases (Yoga group) and 30 controls (non-Yoga group) was recorded pre and 3-month postintervention. Statistical Analysis Used: GraphPad Prism Version 5 software was used. Values are a mean and standard error of mean. Statistical significance was set up at P < 0.05. 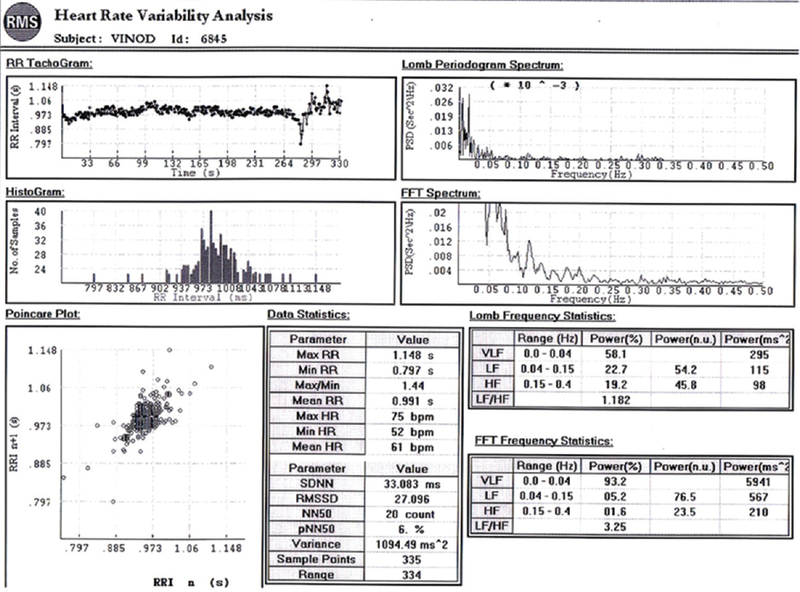 Results: In HRV, frequency domain analysis showed a significant fall in low frequency (LF) in normalized units (nu) and LF: high frequency (HF) ratio and significant rise in HF in nu in the Yoga group (depicting parasympathetic dominance) against a significant rise in LF (nu) and LF: HF ratio and significant fall in HF (nu) in non-Yoga group (indicating sympathetic dominance). Time domain analysis showed a significant decrease in Standard Deviation of NN intervals in Non-Yoga group against nonsignificant changes in Yoga group indicating deterioration in parasympathetic activity in non-Yoga group. Conclusions: Three-month long Yoga practice improved HRV in early postmenopausal women significantly and has the potential to attenuate the CVD risk in postmenopausal women. Objectives: This study was aimed to assess the efficacy of yoga-based lifestyle program (YLSP) in improving quality of life (QOL) and stress levels in patients after 5 years of coronary artery bypass graft (CABG). 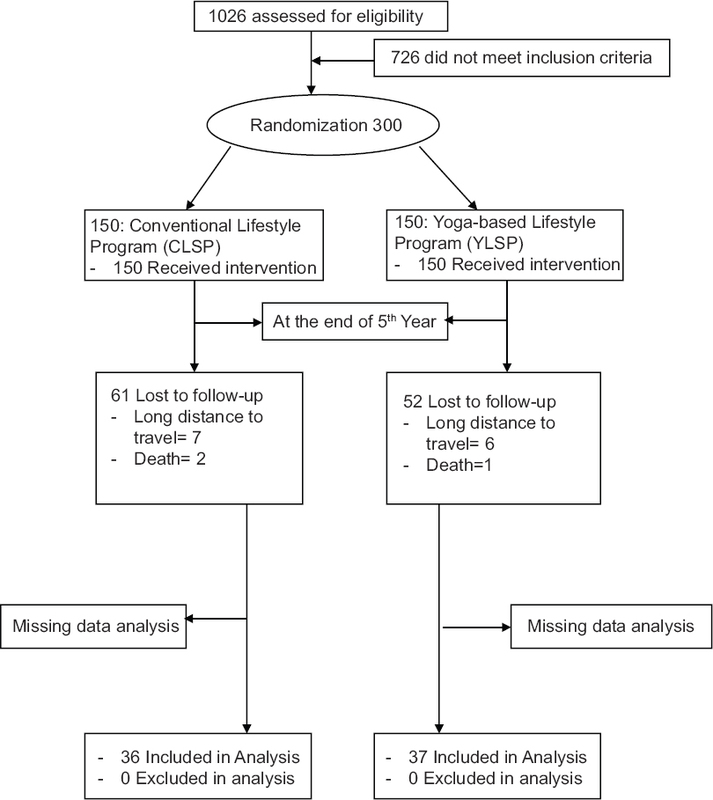 Methodology: Three hundred patients posted for elective CABG in Narayana Hrudayalaya Super Speciality Hospital, Bengaluru, were randomized into two groups: YLSP and conventional lifestyle program (CLSP), and follow-up was done for 5 years. Intervention: In YLSP group, all practices of integrative approach of yoga therapy such as yama, niyama, asana, pranayama, and meditation were used as an add-on to conventional cardiac rehabilitation. The control group (CLSP) continued conventional cardiac rehabilitation only. Outcome Measures: World Health Organization (WHO)-QOL BREF Questionnaire, Perceived Stress Scale, Positive and Negative Affect Scale (PANAS), and Hospital Anxiety and Depression Scale (HADS) were assessed before surgery and at the end of the 5th year after CABG. 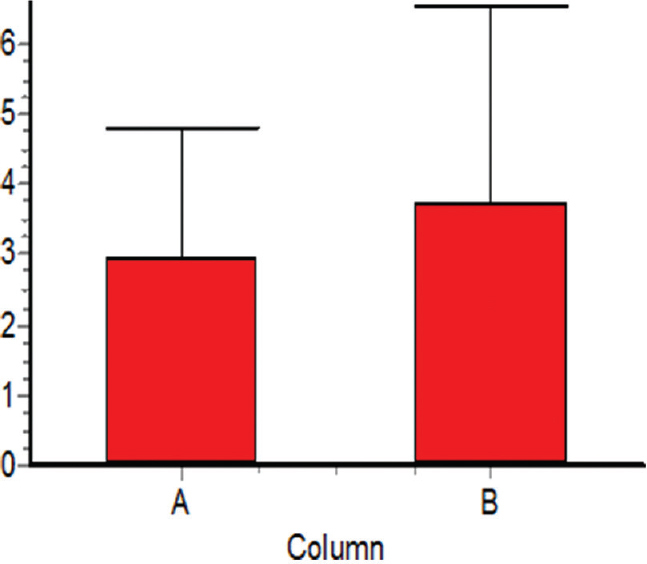 As data were not normally distributed, Mann–Whitney U-test was used for between-group comparisons and Wilcoxon's signed-rank test was used for within-group comparisons. Results: At the end of 5 years, mental health (P = 0.05), perceived stress (P = 0.01), and negative affect (NA) (P = 0.05) have shown significant improvements. WHO-QOL BREF score has shown improvements in physical health (P = 0.046), environmental health (P = 0.04), perceived stress (P = 0.001), and NA (P = 0.02) in YLSP than CLSP. 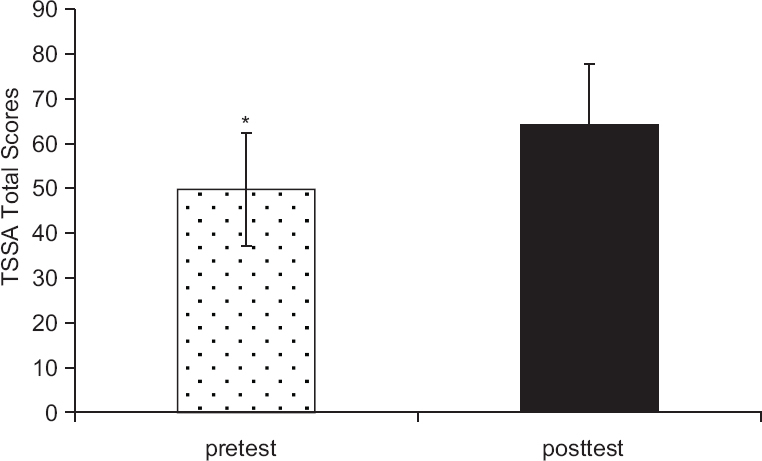 Positive affect has significantly improved in CLSP than YLSP. Other domains of WHO-QOL-BREF, PANAS, and HADS did not reveal any significant between-group differences. Conclusion: Addition of long-term YLSP to conventional cardiac rehabilitation brings better improvements in QOL and reduction in stress levels at the end of 5 years after CABG. Context: Different types of breathing exercises have varied effects on cardiovascular parameters and the stress levels in an individual. 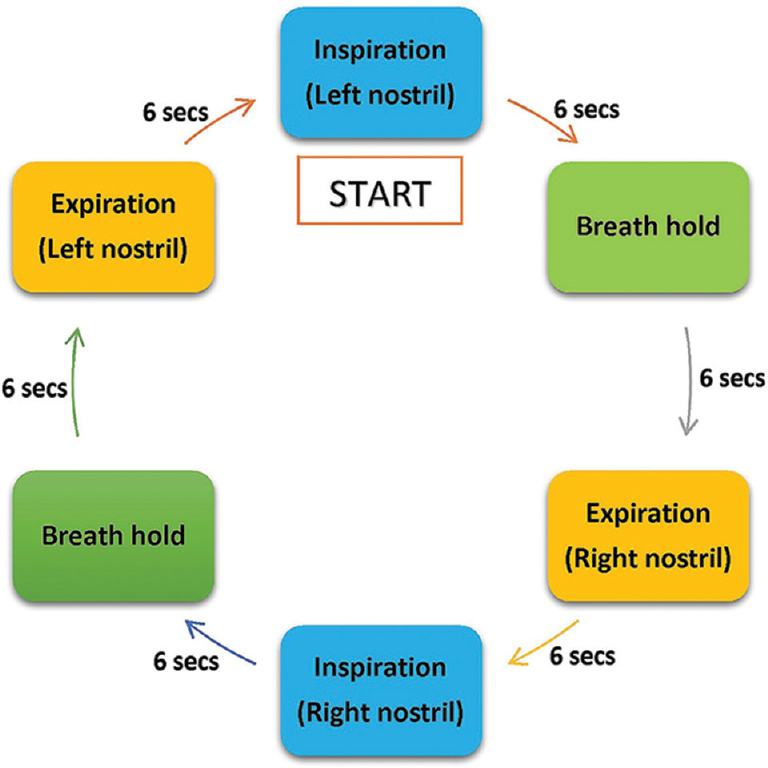 Aim: The aim of this study was to assess the effect of a modified form of isolated alternate nostril, slow breathing exercise on perceived stress, and cardiovascular parameters in young, male volunteers. Settings and Design: This was a randomized control study carried out at Advanced Centre for Yoga Therapy Education and Research, Department of Physiology, Jawaharlal Institute of Postgraduate Medical Education and Research, Puducherry in 2014. Subjects and Methods: Hundred healthy male volunteers were randomized into control group, n = 50 and slow breathing group (study), n = 50. Slow breathing exercise training was given to study group for 30 min a day, 5 times/week for 12 weeks, under the supervision of certified yoga trainers. Perceived Stress Scale (PSS) using Cohen's questionnaire, anthropometric parameters such as body mass index (BMI), waist-hip ratio (WHR), and cardiovascular parameters such as heart rate (HR), systolic blood pressure (SBP), and diastolic blood pressure (DBP) were recorded at baseline and after 12 weeks. The control group did not receive any intervention. Slow breathing exercise training was provided for the study group. During the study period, one volunteer opted out of the study group due to personal reasons. Results: HR, SBP, DBP, and PSS decreased significantly (P < 0.05) in the study group following 12 weeks slow breathing exercise training, while no significant change (P > 0.05) was observed in BMI and WHR. There was no significant change in the control group. Conclusion: Twelve weeks of modified slow breathing exercise reduced perceived stress and improved the cardiovascular parameters. The above results indicate that our modified slow breathing exercise is effective in reducing stress and improving the cardiovascular parameters. Context/Background: Many studies showed positive effects of Yoga Asanas. There is no study on Maharishi Yoga Asanas yet. This research replicated and expanded observed improvements on the profile of mood states (POMS) as a result of 2-week Maharishi Yoga Asanas course. Thirteen college students taking part in a 4-week course on Maharishi Yoga Asanas were matched with 13 students taking other courses at the university. Aims and Objective: The main objective of the study was to assess the effects of Maharishi Yoga Asanas on mood states, degree of happiness, and experiences in Transcendental Meditation (TM) practice. Methods: All students were given two psychological tests and additional question before and after their 4-week course: POMS, Meditation Depth Questionnaire, and question about the degree of happiness. Results: Repeated measure MANOVA showed the 4-week Maharishi Yoga Asanas course resulted in significant increase in happiness during the day and significant improvements in (1) sense of personal self, (2) transpersonal qualities, and (3) transpersonal self during their TM practice. 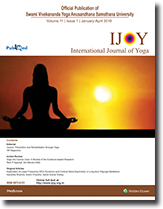 Conclusion: This research shows that Maharishi Yoga Asanas affect more than body and mind. Rather they influence much deeper levels of one's subjectivity including one's transpersonal self. Background: Human eye captures light rays as they come and fall on the retina and convert them into an image. However, in myopia, light rays fall in front of retina, causing blurring of image. Correction of this is generally done using correcting devices such as corrective glasses and contact lenses. Existence of some alternative therapies is also noticed in literature. Aim: To compare the effects of Bates eye exercises and Trataka Yoga Kriya on myopia. Materials and Methodology: Ethical clearance was obtained from the institution, and informed consent was taken from participants. In this randomized comparative study, 24 participants (48 eyes) were taken based on inclusion and exclusion criteria and were randomly divided into two groups: Group A and Group B, where Bates eye exercise therapy and Trataka Yoga Kriya were given, respectively, for 8 weeks. Participants were assessed for their refractive errors and visual acuity pre- and post-intervention. Results: Data were analyzed by SPSS version 20. Results obtained revealed that both Bates exercises and Trataka Yoga Kriya were not significantly effective in reducing refractive errors and in improving visual acuity (P value of refractive error in right eye: 0.4250; left eye: 0.4596; P value of visual acuity in right eye: 0.5691; left eye: 0.8952). Conclusion: This study concludes that nonpharmacological approaches such as eye exercises and Trataka Yoga Kriya are not significant on myopia. The present investigation was undertaken to examine the effects of mindfulness-based cognitive therapy (MBCT) on interepisodic symptoms, emotional regulation, and quality of life in patients with bipolar affective disorder (BPAD) in remission. The sample for the study comprised a total of five patients with the diagnosis of BPAD in partial or complete remission. Each patient was screened to fit the inclusion and exclusion criteria and later assessed on the Beck Depressive Inventory I, Beck Anxiety Inventory, Difficulties in Emotion Regulation Scale, Acceptance and Action Questionnaire-II, and The World Health Organization Quality of Life Assessment-BREF. Following preassessments, patients underwent 8–10 weeks of MBCT. A single case design with pre- and post-intervention assessment was adopted to evaluate the changes. Improvement was observed in all five cases on the outcome variables. The details of the results are discussed in the context of the available literature. Implications, limitations, and ideas for future investigations are also discussed.